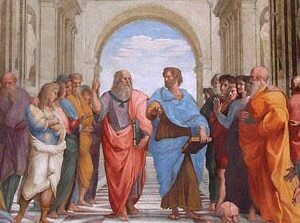 After having read textbook section on Athens Golden Age, review the period and the ideas of the three philosophers: Socrates, Plato and Aristotle. Ask students what Aristotle is known for today (scientific thinking and philosophy). Convey the idea that psychology grew out of the ideas of philosophy applied through a more scientific lens. Aristotle’s scientific leanings included pursuing an understanding of happiness. Using the website reading as a guide, discuss Aristotle’s definition of happiness, virtues, and use Powerpoint slides on Aristotle. Introduce his concept of the Golden Mean as a way to achieve balance and happiness, using slide. Put up some examples of graphing a virtue with its excess and deficiency with students on the board. Help students to understand by asking about people they know. If this discussion/debate goes well, it can take most of the entire period. Explain and assign worksheet on Golden Mean which uses Martin Seligman’s 24 character strengths (or virtues). Students should pull out the homework and get into groups with friends. Explain that this is a chance for them to share in confidence something about who they are. They can share what virtues they circled as their strengths and which they placed boxes around that they would like to work on. Teacher should circulate and help students with the exercise. Some will find defining the excess or deficiency of a virtue to be difficult. (Do not collect this personal piece). Discuss a little about Positive Psychology and the 7 keys to happiness that psychological research has uncovered in its studies. Make the transition from Aristotle to psychology by pointing out that psychology, as we refer to it, is a modern science, yet Aristotle was grappling with issues of the human mind thousands of years ago. (Use Powerpoint slides here). End class by assigning reading and questions on Alexander the Great. Explain that Alexander was a student of Aristotle and that he studied under him as a teenager. Tell students that we are going to focus on whether Aristotle’s teachings were absorbed by Alexander or not. Open class with discussion of what sort of person Alexander was. Put student responses on the board. With the students begin grouping the specifics under more general qualities that Alexander had. As some qualities will be more positive and some more negative, you might end up grouping qualities as virtues and vices. Ask students to continue taking notes during today’s video about Alexander the Great, keeping in mind the following question: Did Alexander follow Aristotle’s teaching about happiness? (Video I use is: The True Story Of Alexander the Great, History Channel). Finish video today, but start off with the question we ended with yesterday: whether Alexander was happy according to Aristotle’s definition? Or whether he was a good student or not…Discuss to focus students on what to look for in video. You might put up reasons as YES/NO on board. Finish video, while students continue to take notes. You may take the thesis as it is written and reverse it or negate it, or modify it to fit your viewpoint. A. Alexander the Great followed Aristotle’s teachings in his life. B. According to Aristotle’s definition of happiness, Alexander the Great achieved happiness in his life.